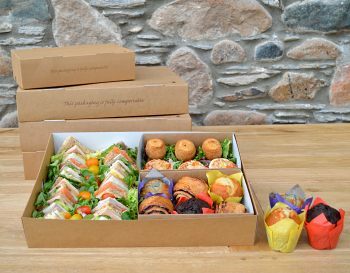 Our extensive range of sandwiches & finger foods come delivered to you in practical & stylish packaging, which has the added benefit of being 100% biodegradable & compostable. We can provide anything from a lunch box for as few as four people to an extensive buffet for up to 200 people. We also have an imaginative range of sandwich platter boxes. Simply click on the tabs to the left to explore our range of services & for more detail on our competitive pricing structure. Please feel free to call us at any time if you'd like to discuss your requirements in more detail.